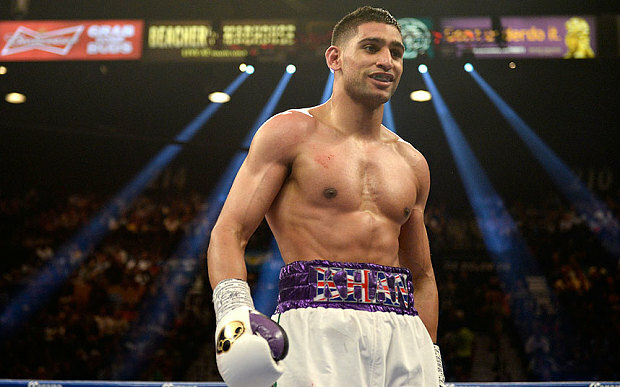 Amir Khan (31-3, 19 KO) is looking for stardom. Approaching thirty years of age, his record suggests that he has been around for some time. Probably feeling that his first round knockout loss to Breidis Prescott was a fluke – blind shot, weight drainage, whatever – and nonetheless feeling unbeatable because no one could match his speed, there has been palpable selective matchmaking since another defeat to current WBC welterweight champion Danny Garcia. Low risk, low reward; high risk, high reward has been the formula since. For Khan, “low risk” involves avoiding known punchers and relying on his reach and speed to out box pure boxers. But Khan is truly a vain individual. For rather than face IBF champion Kell Brook, he has decided to jump another division for Saul Alvarez (46-1-1, 32 KO) who is the WBC champion at middleweight. Khan supporters cite this match up as proof that Khan was not avoiding Kell Brook. While I have no opinion regarding whether or not Khan evaded Brook, the truth is, the power and size of Alvarez notwithstanding, Alvarez may be a more favorable opponent for Khan in terms of style. Khan would be threatened by the power of either Alvarez or Brook. Therefore, consideration of what extra pop Alvarez may or may not have over Brook becomes unsubstantial. After all, Floyd Mayweather, shopworn Shane Mosley, and others have taken Alvarez twelve rounds. Then just maybe Alvarez is a very risky, but cherry picked nonetheless, selection by Khan. Khan has stated that Mayweather set the “blueprint” for beating Alvarez, but he, Khan, is faster and more athletic than Mayweather and thus can do it better so long as he sticks to the strategy. The problem with Khan is that he has always been a fast boxer, not a smart boxer. The advantage in hand speed that Khan may possess at this time – fractions of a second – means nothing given the predictability of his combination punching. Left jab, straight right hand, left jab or left hook again – that is his pattern. Never does Khan throw multiple jabs before a right hand. Never does Khan throw a lead right hand without a jab. Never does Khan throw a left hook without first preceding it with a right hand. Therefore, Khan can only use a left hook if he first throws the jab and then the right hand. 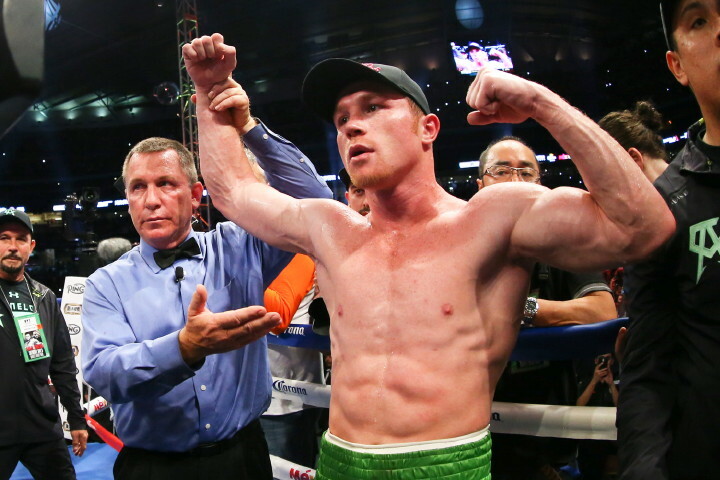 Khan will not defeat Alvarez with combination punching; Alvarez will punch with him and take several to give one. An active jab and crisp, varying, single, precise power shots with movement is what will get the job done. Aside from the jab, Khan needs to work on reducing his work rate and improving his accuracy with better timing. He should limit the number of left hooks thrown after right hands, for this where Alvarez will want to counter him with his own left hook. However, Khan has the speed to lead with the left hook and move away before Alvarez can return. Khan must do the bulk of his work with jabs and straight right hands. Before closing, what needs to be iterated is that Khan can not weight lift himself into a junior middleweight or middleweight. A fighter's proper division is determined by his bone mass. The size of ones skeleton is the biggest influence on power and punch resistance. Heavier bones in the forearms and hands results in more punching power. A heavier and thicker skull does not jar as forcefully from punches to the head reducing the likelihood of concussion. So, whatever Khan's weight on fight night, his frame is that of a not even fully mature welterweight. Likewise, the stoutly built Alvarez carries much water in his muscle tissue and rehydrates to a comparable mass as other middleweight champion Gennady Golovkin. But Golovkin is less muscled than Alvarez, carries less water, and has a heavier bone structure. In boxing terms, contrary to statements made by Golovkin, Alvarez is smaller than Golovkin. The winner of Khan-Alvarez is mandated to face Gennady Golovkin next. But history has shown that this mandate carries no weight. Khan-Alvarez airs on HBO Pay-Per-View Saturday, May 7, at 9PM US Eastern time in the US and on BoxNation at 1:30AM (Sunday morning) in the UK. 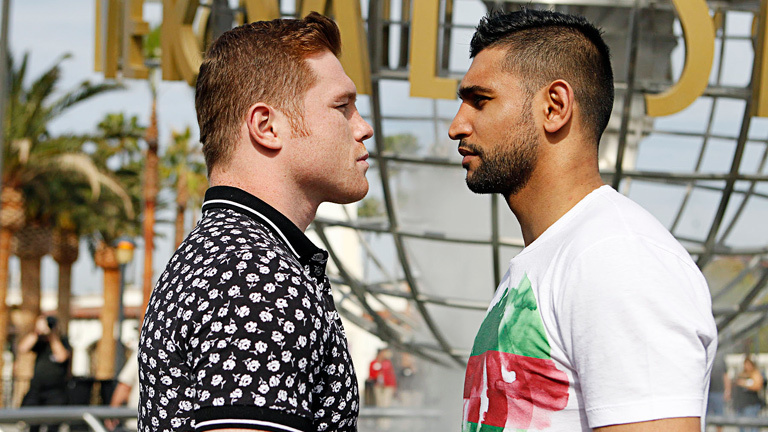 Preview and predictions ahead of WBC Middleweight title bout between Saul 'Canelo' Alvarez and Amir 'King' Khan on May 7 2016 at the T-Mobile Arena in Las Vegas, NV.